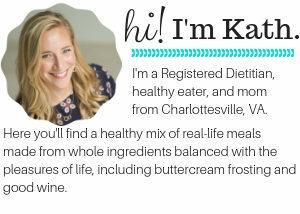 Today I have a guest post from Registered Dietitian Kayli about her experiences an entrepreneur. Many of you email me inquiring about options in the dietetics field, and I know lots of you are interested in working in the food and nutrition industry, so I hope her tips are helpful! I am Kayli and to tell you what I do requires a short answer and a long answer. The long answer: “I’m a plant-based nutrition expert, personal chef, social media manager, weight loss coach, sports nutritionist, college professor, and writer.” Phew! So how did I get from the short answer to the long answer? My path was (and is!) anything but ordinary- as it should be if “nutrition entrepreneur” is your dream job. Here is my story and three lessons I’ve learned that have helped me piece together my entrepreneurial nutrition career so far. Lesson #1: Say it out loud! I studied nutrition and business at Saint Louis University and after graduating with a Master’s in Nutrition and Physical Performance, my professor and mentor offered me a job at her nutrition consulting company McDaniel Nutrition Therapy. Why did she offer me job? Partly because I told anyone who would listen (including her) that I wanted to do what she did. If no one knows what you want, no one can help you get what you want. So tell anyone who will listen! By the same token, find out how you can support others in return. Helping your colleagues by promoting them, connecting them, and encouraging them will get you much farther than competing with them. (And it is much more fun!) Many of my opportunities came from supporting other people who returned the favor by supporting me. Kath does this well by sharing her platform with guest RDs! Lesson #2: Start right now! How many times has someone told you that you should work a traditional dietetics job before doing something innovative? Nonsense! A traditional job (clinical, community or foodservice) can offer valuable experience, but when your gut tells you those jobs aren’t a good fit, listen! Don’t forget how far-reaching the field of nutrition is, and don’t be afraid to use your credentials in creative ways. 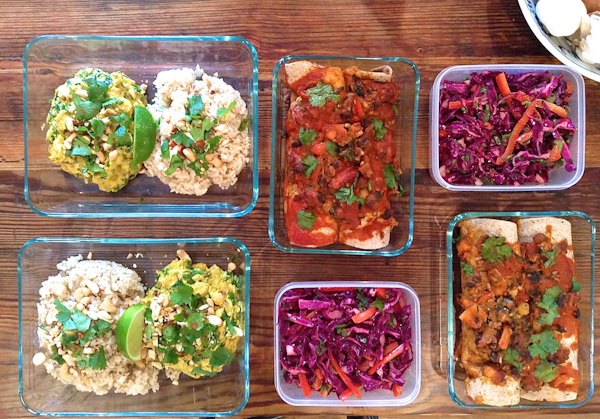 I own a plant-based personal chef and nutrition company, True Food Co., where I prepare healthy plant-based meals for clients tailored to their nutrition goals. Before I started True Food Co., I worried that I was too young, too inexperienced, too “fill-in-the-blank” to be an entrepreneur or a personal chef! Those feelings are totally normal, but you are likely much more prepared than you think. If you really do need more experience/time/money/education before jumping in to entrepreneurship, you can still take baby steps today. Read a business book, reach out to someone who is already doing what you want to do, start talking to people about your ideas. Do something, however small, right now to move in the direction of your dream job. 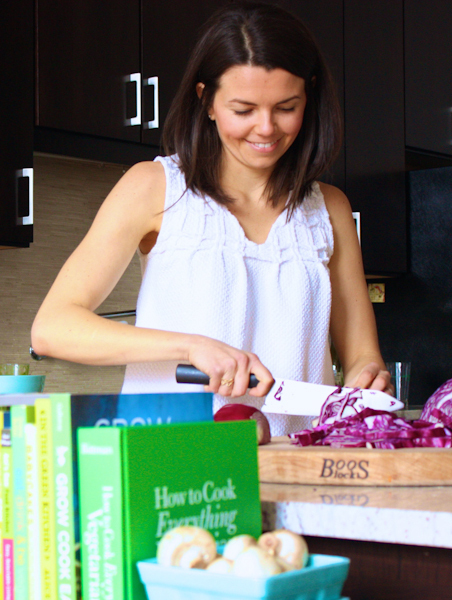 Before I started True Food Co., I devoured books on entrepreneurship and cooking. Life is too short to put your dreams on the backburner. Nutrition entrepreneurship, as glamorous as it sounds, is not all rainbows and cupcakes. Sometimes it’s hard and scary and overwhelming, so you must have grit to endure those moments. Grit keeps you motivated when the road gets rocky and reminds you of your passion when you feel like giving up. In addition to the gigs I already mentioned, I also teach nutrition courses at a university, co-write a recipe blog, The Plant Eaters’ Manifesto, with my husband, and work on several freelance projects. With so many balls in the air, some days are insanely busy and, surprisingly, some days are eerily quiet. Grit helps me stay focused on my goals through the inevitable highs and lows of being an entrepreneur. Let’s put these lessons into action, shall we? What step will you take today toward becoming a nutrition entrepreneur? What do you want to do and whom can you talk to about it? An Example: my current focus is my recipe blog, The Plant Eaters’ Manifesto, so I am reading about food photography and reaching out to other food writers for advice. Now, tell me how I can help you with your goals! I am also a LARABAR Ambassador (lesson #4: as an entrepreneur, you must wear many hats!) and the wonderful folks at LARABAR gave me bars to share with a lucky winner! One lucky (USA) winner will receive a mix of classic, Uber and mini Larabars! 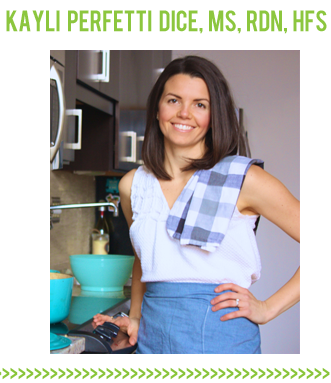 Kayli Dice, MS, RDN, HFS is a plant-based chef, dietitian and food writer who helps people fall in love with simple food. Follow her and her husband’s food for thought and plant-based recipes at The Plant Eaters’ Manifesto. Learn about Kayli’s nutrition and cooking services at True Food Company. Apple Pie and Chocolate Peanut Butter! My favorite flavor is key lime pie! I love any larabar that does NOT have chocolate..as I am allergic to it. My favorite Larabar flavor is the oatmeal chocolate chip! My favorite flavor is carrot cake! Peanut butter cookie is the best flavor Larabar! Thanks for sharing this insightful information! I love carrot cake and apple pie larabars! So good! My favorite is chocolate chip cookie dough! Entrepreneurship- hire people who are at least as talented as you are. Don’t fear the growth of your employees and colleagues. Work from an abundance mentality. Kayli, good for you for following your dream! Larabars are awesome! As a dietician, do you ever deal with difficult clients? that’s my biggest fear ask an aspiring nutrtionist! I think that is a very common fear! Our imagination often conjures up the “worst case scenario” and creates fear. In my experience, that worst case scenario rarely comes true. Most people are so happy to have someone listen, validate their struggles, and help them. Sure, I’ve had a difficult client or two. I remind myself that whatever is causing them to be difficult isn’t about me, it’s about their own “stuff”. These are the people that tend to need the most compassion and understanding so I try to give them that. I love any Larabar with chocolate! I havent found a flavor I dont love but my favorite is the cashew cookie! Pecan pie !! And Blueberry muffin !! And coconut creme pie !! This was such an inspiration coming at just the right time! I’m at a pivotal point where I’ve quit my big girl job and I’m working two part time jobs until I figure out what is next – my heart says nutrition of some sort, but that sort of change is scary! Thanks for sharing your story and for letting us win some Larabars! yum! Keep me posted on your endeavors- I’m happy to help if I can! I love the “Start right now” advice, that is so true! Great guest post, thank you!! I love the carrot cake! My favorite Larabar flavor is chocolate chip cookie dough! Love it! Kath–none of the links in this post seem to be working. I’d like to check out Kayli’s work. Could you update the links? Yikes! Sorry about that. They are all fixed now. Chocolate coconut chew is my favorite flavor! Peanut butter chocolate chip for sure! It’s so great to hear about your path to your dream job! I went to SLU as well and am now in my dietetic internship. Any Larabar with peanut butter = amazing! I keep Larabars in my purse, work bag, car, gym bag, and stocked up in my pantry as my favorite snack! Peanut butter cookie and peanut butter and jelly are my favorites! That food looks SO good!! I haven’t had a Larabar in years, but I’d love to try them again! I’ve learned that you have to just put yourself out there and go for it, and that it’s okay to fail because you learn from every failure. As long as you keep getting up and trying again! SO TRUE Katie! I agree, I like to think of them as “learning experiences” instead of “failures”. I love the chocolate peanut butter! PB cookie larabar is the best. Great post! Thank you Jennie and good choice! I love the pecan pie flavor or the peanut butter cookie! I love the cashew cookie flavour! I’m embarassed to say that I’ve never tried Larabars, but I probably should. My husband eats these bars every single day and I’m trying to find some healthier options for him. The carrot cake sounds awesome and I think the oatmeal chocolate chip would be a huge hit in our house! Yummm! Peanut butter and chocolate! Cashew Cookie is definitely my favorite LARABAR flavor! I love the peanut butter cookie Larabar! Thank you Laura! That is my husband’s favorite flavor too! Favorite flavor = Pumpkin Pie! Great post! Kath, I was wondering, how do you get the majority of your CEU’s? just curious. I get a lot through dietetic association meetings – both local and the Virginia one which I went to a few years ago. And there are lots of opportunities for online learning. I front loaded my CEUs knowing I was having a baby and did a lot more my first few years out of school. I’ll do the same when my cycle is up in 2016 and get a lot into the first few years and taper off a bit. I hate procrastinating! I love carrot cake larabars! Apple Pie Larabar is by far my favorite! This was such a fun read! Thanks for virtually introducing us Kayli! Dani- nice to meet you! sending you a virtual hug 🙂 Thank you! My husband is an entrepreneur and something I’ve learned from him is that networking is incredibly important. So many of the opportunities he’s received have been from someone recommending his services to a colleague. Side note: I went to school for dietetics from a big university, after I graduated I decided not to pursue the R.D certification or do the internship (mainly because of finances). I really regret this and am now working in an unrelated field. Can you tell me if at this point I’d still be able to get the R.D accreditation? Or how to pursue it? I graduated college in 2008. Great advice! Networking is so important and it’s best to do it all the time vs. only when you are looking for a new job or opportunity. You will first have to complete a dietetic internship. There are flexible/self-directed options for this popping up every year! I suggest you visit eatright.org and All Access Internships (where I am a coach!) http://allaccessinternships.com/dietetic_internships_101.php to get acquainted with the dietetic internship process and options. Your real world experience, even if unrelated to nutrition, will set you apart! I love the cashew cookie flavor! blueberry muffin larabars are superior! I love Lara bars! PB & J is my current fave but I also love coconut cream pie and peanut butter cookie for dessert. I just had a coconut crème pie Lara bar for a snack! YUM!!! the lemon and the chocolate coconut! I love the raspberry chocolate uber bar! Thanks for the opportunity! Larabars are one of my top on the go snack options. My favorites are PB + J and Snickerdoodle (which I believe is seasonal). You are welcome! LOVE Snickerdoodle! Definitely coconut cream! So delicious!! Awesome giveaway!!! I am loving the Lara Alt bars. I like that they have pea protein. My favorite flavor is the chocolate macaroon. So good! Thank you Nikki! You are the best!! My favorite larabar is definitely cherry pie! Wow, congratulations on all your hardwork and success! My favorite Larabar is the coconut cream pie, I’m a coconut girl all the way! Have you tried the Chocolate Coconut Chew or the Chocolate Chip Macaroon ALT bar? If you love coconut, you will love these two flavors! I don’t know if I could pick a favorite LaraBar flavor, every one I’ve tried has been delicious! My favorite flavor is PB cookie! peanut butter cookie is my favorite! I love the Peanut Butter Cookie! I love any of the chocolate and peanut butter-flavored Larabars! 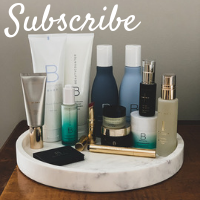 Thanks so much for the guest post! As a student with a vested interest in entrepreneurship in the health space, this was very educational. That’s awesome that you have an entrepreneurial spirit already– let me know if I can help in any way! Thoughts on entrepreneurship – if it were easy, everyone would do it. I know that gets thrown around a lot, but it’s very true. I’m still trying and hanging in there — your post and businesses are inspiring! Favorite lara bar falvor – I love the Apple Pie and Cashew Cookie. I’m also a big fan of the Alt bars! My favorite Larabar is coconut cream pie – I love anything with coconut! Love Lara bars! they get me through the mid day munchies! nice elevator pitch for your career! My favorite larabar is coconut macaroon! Peanut butter cookie is my favorite (tough decision) and I’ve learned you need to be persistent and have a schedule for entrepreneurship! Yes, persistence is key! It usually takes 9 “no’s” before you get that illusive “yes”. Great advice! My favorite Lara bar flavor is cashew cookie! Chocolate chip cookie dough and cashew cookie! I always have a Larabar stashed in my car. I love cashew cookie and carrot cake. I love the gingerbread and pumpkin pie Lara bar flavors! I love photography and help my boyfriend with it because I learn how to take good photos. This is my baby step into cooking my healthy food and showing people how they can do the same and have fun at the same time. Thanks for sharing your tips and helping others just taking the small steps right now 🙂 I would love LARABAR Peanut Butter Cookie!! Aida, great first step! I’m working on photography too 🙂 Keep cracking away at those baby steps and soon you will have taken a giant leap! This is a really great reminder for me that I/we are never too old to pursue our dreams. Thanks for that reminder. Truth! I hope you are taking some baby steps to pursue your dreams 🙂 Love your blog! I have not found one I dislike. Chocolate chip cookie dough for sure! I love the pumpkin pie flavor! Peanut butter and jelly sounds delicious as well. I love the Apple Pie flavor. Mmmm! Coconut cream pie and blueberry muffin are my faves. I just tried the seasonal Snickerdoodle Cookie Larabar and it was so good! I also love the new ones with pea protein for a better protein bar option. Melissa, we are LARABAR kindred spirits 🙂 Seasonal Snickerdoodle is worth the wait every year and I’m obsessed with the Chocolate Chip Macaroon ALT bars- they definitely fill a hole in the protein bar market! Cashew Cookie is my favorite ! I love cherry pie Lara bars! I love the peanut butter cookie ones! delicious and filling. Cashew cookie and PB Chocolate Chip all the way! Good advice! My favorite Lara bar flavor is peanut butter cookie! Thanks Kayla 🙂 Can’t go wrong with a flavor that has “cookie” in the name! Love all the ones I have tried so far! Cashew cookie is probably the leader:) the mini bars are great for my kids !! Cashew cookie is my favorite! I LOVE larabars. Blueberry muffin and peanut butter cookie are my fav’s! I love how she said "don’t be afraid to use your credentials in creative ways". As a soon-to-be RD, I don't feel drawn to the traditional routes either- I love her confidence about it. Apple pie Larabars are the best! I love the mini Uber cherry on hikes- easy to eat and so refreshing! I just learned they have Larabar minis! A friend gave one to me as a sample. So exciting! Peanut butter cookie’s my fav. Tastes like the real thing! Congrats to you on your accomplishments! Chocolate chip cookie dough. I loved their seasonal Gingerbread bar. I also learned about letting people know what you want to do. I make all these plans in my head but I never say them out loud so no one really knows what I want. Time to change that! I need to eat more larabars! Chocolate chip is my favorite flavor. Cashew cookie is definitely my favorite! I love the peanut butter cookie ones! This is a wonderfully insightful post! I am in the process of transitioning from my full-time corporate job to nutrition student. I’m currently in the process of taking my pre-reqs for MPH Nutrition/RD Programs (unfortunately, my Business undergrad wasn’t very helpful!) and have essentially had to start college all over. It’s been an adventure! But I know it will definitely be worth it. I am also a Personal Trainer and Fitness Instructor and ultimately I want to have my own all-encompassing wellness practice. It will definitely be challenging, but so worth it! Les, good for you for making that tough transition back to school! I actually studied business before nutrition too and, although it might not feel useful in you nutrition classes now, it will definitely come in handy- promise! Business skills are a rare gem in the dietetics profession, so your background will set you apart and help you succeed in creating your practice in a smart, business-savvy way. Let me know if I can help you in any way! blueberry muffin is my fave! Oatmeal chocolate chip or any seasonal flavors! Tell people what you want so they can help you! Favorite flavor? Cashew cookie. Biggest thing I’ve learned as an entrepreneur: don’t call yourself a freelancer. It sounds more amateur than you are. As someone going into the dietetics field, I LOVE this post. I want to be an entrepreneur too so this was perfect. Thank you for the insight! i love the pb&j larabars! thanks for the post, it was inspiring! Apple Pie is my fave! Coconut cream pie Lara Bars are my all time fave! I eat a cherry cobbler uber Lara Bar every single day for my mid morning snack!! I LOVE chocolate chip cookie dough!! Favorite is coconut cream pie! I love peanut butter chocolate chip or cashew cooki! Very cool to read this – I’m a SLU intern now wih all the same fears about going into private practice! This is inspiring and makes me excited. I live for the cashew cookie larabars. I try to make my own when I buy a huge bag of dates and realize I’ll never eat 5 lbs plain…but they’re never as good as the real deal. Lizzie! That’s awesome to hear. The world of private practice certainly is a wild and exciting ride 🙂 Let me know if I can help you in any way. You can’t go wrong with Cashew Cookie- classic! I love, love, love the seasonal Gingerbread flavor!! They need to bring it back!! Cashew cookie or bananas foster are my favs! blueberry muffin or carrot cake!! Favorite flavor would definitely have to be Uber Coconut Macaroon. Dark chocolate peanut with sea salt is the BEST! I am currently enrolled in an online dietetics program (I work full-time as an administrative assistant); working on getting a nutrition degree so that eventually I can transition into that field. This was a really encouraging post for me. Sometimes it’s hard to remember why I add school on top of the mix of everything else in life (especially when I think about how much school I have left…). Thanks for reminding me that I can help people. I can use my passions to do something different than I am now and enrich the lives of others. Devra, you are superwoman! Your “real world” experience outside of school will set you apart in the field 🙂 Stay focused on that goal to follow your passions and enrich peoples’ lives. Let me know if I can help in any way! My favorite flavor is applie pie. I really enjoyed the post. Kayli gave a lot of helpful advice and was very inspiring. Favorite larabar flavor(s) because I can’t choose just one – peanut butter cookie, blueberry muffin, snickerdoodle and key lime pie. The Chocolate Chip Cookie Dough is amazing!! Snickerdoodle is my favorite with peanut butter chocolate chip being a close second! Snickerdoodle, choc. chip cookie dough, many of them! I love ALL Larabars. My refrigerator is stocked with a bunch, but my ultimate two are chocolate peanut butter and the lemon ALT. This is great! One of my dreams is to become a nutrition entrepreneur, after a few years of procrastination I’m calling this year my “action” year, and I’m taking baby steps to make it happen! Thanks for sharing your tips. My favorite flavor is Key Lime Pie! I loved reading these tips. I’m currently waiting to see if I am accepted to grad school to start studying nutrition and to pursue becoming an RD! I’d love to incorporate some form of entrepreneurship in my career. I needed to read the reminder about telling people what you want. Since my future plans are up in the air right now, sometimes I’m hesitant to tell others about what I want to do. I’m working on gaining more confidence in this area! Thanks for sharing your thoughts! I love key lime pie, and there is one that is something like cherry pie that I love too. Mmmm. My favorite is the peanut butter cookie! What great advice Kayli! I must be 20 years older than you and I earned my RD in the late 90’s but took time off to raise my kids. I regretted not having a “traditional” job for the clinical experience, but I never wanted a clinical job. Now, I wear lots of hats; I counsel, teach classes to groups that request them, I write for a professional newsletter, I consult for the local school district and I blog. All of this under the nutrition umbrella. I was wondering if you could recommend some of the business books you read. While I am quite creative, I don’t necessarily have the skills to put all of my ideas into action. Thanks! Beth, you are doing such great things! I love hearing about all the creative ways RDs use their credential. A couple of my favorite books: any of Seth Godin’s books especially “Tribes”, and “E-Myth” by Michael Gerber. I also recommend listening to the NPR Ted Radio Hour podcast called “Disruptive Leadership”- It’s really inspiring! One of my mentors Jean Caton is an RD turned business coach and she always posts inspiring articles, quotes, and books! Follow her on social media. I plan to dedicate a page to these types of resources on planteatersmanifesto.com, so stay tuned if you’re interested in more recs! The ‘telling people what you want’ advice is striking a chord with me, but in a way that brings up an issue I’m facing. I recently accepted an opportunity from my adviser to continue on and get a PhD in a field of nutrition, and our focus area is one I know I don’t want to be in forever. It took me a long time to make this decision, partly because I knew it wasn’t in an area I wanted to be in for long, but I made the decision for other good reasons. However, I feel like it restricts me from telling the truth about what I want for my (long-term) future. I tell other people, but I am afraid of telling her, because I don’t want her to doubt my commitment to our current project. So I feel constricted as far as pursuing my true passions, even though I feel like that will still be possible for me after I get this degree. Anna, that is a difficult situation to be in! First of all, congrats on accepting such an important opportunity! We certainly need more PhD’s in our field. Staying true to yourself is hard, especially when you worry that your truth will disappoint/hurt someone else. I encourage you to be honest about your interests AS WELL AS your commitment to earning your PhD. I think you can have both 🙂 I would guess that as much as your advisor cares about the research you’ll be doing, she also wants you to succeed in the nutrition field. The best way to succeed is to do passionate work! Chocolate Peanut Butter and Lemon! As a sophomore currently studying Nutritional Sciences, this post is so motivating for me. I have always wondered what other options in nutrition there might be, and this gives me some. Abby, so happy this motivated you 🙂 Traditional dietetics education really doesn’t expose us to the endless options! Let me know if I can help you in any way. I haven’t had the luxury of trying many Larabar flavors since the stores near me don’t have a variety in stock, but I love the peanut butter ones! Coconut cream pie, blueberry muffin, and cherry pie. But I’m always rotating through to make sure another flavor hasn’t moved to the top spot ???? Love the coconut macaroon bars! Any of the fruit flavored bars! So delicious! I love the Banana and Carrot Cake flavors! NOM. First off hey I’m a SLU grad! S-A-I-N- T L-O-U-I-S! loved reading this- currently working clinical but know it’s not the best fit- very inspired. Ellie- Awesome! Go Bills! 😉 So happy to hear you are feeling inspired. Don’t hesitate to reach out if you’re still in STL and feel like I can help you in any way! i always go with the apple cinnamon or anything chocolate! My favorite flavor is cherry pie! Cinnamon roll Larabars are really good! Thanks for sharing about your career! Apple pie or key lime! Thanks for such insightful words! Not heard enough these days I think. My fav larabar flavor is the chocolate chip cookie dough…how do they make the choc chips so dreamy!? Wondering if you recommend any CEUs for dietitians interested in entrepreneurship either within the field of nutrition or outside of nutrition?